Before I write this review, I have to acknowledge that my reviews have been few and far between lately because it has been a VERY busy summer for this pizza critic, so I have to apologize to all of you who might be eagerly awaiting reviews. 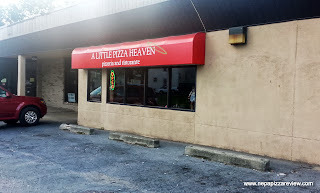 The good news is that I’m back with another review and hopefully my evenings will start to open up a bit so I can visit the rest of NEPA and let you know what’s good out there in the pizza world! 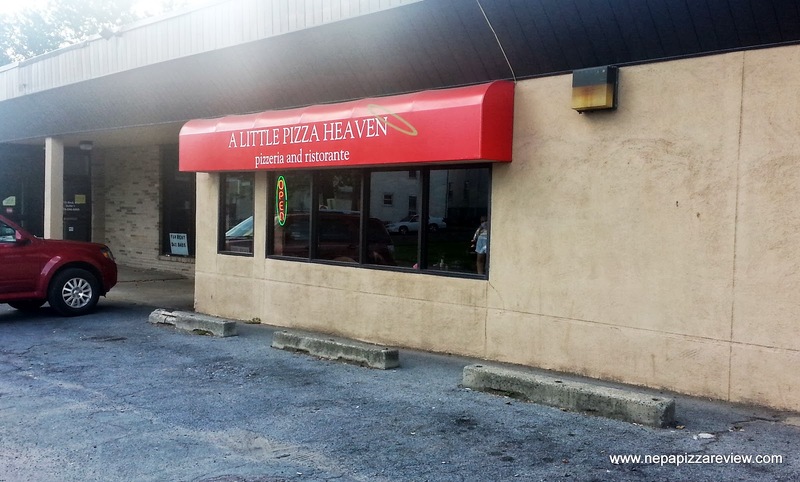 With that being said, today’s pizza review takes place at A Little Pizza Heaven in Scranton. 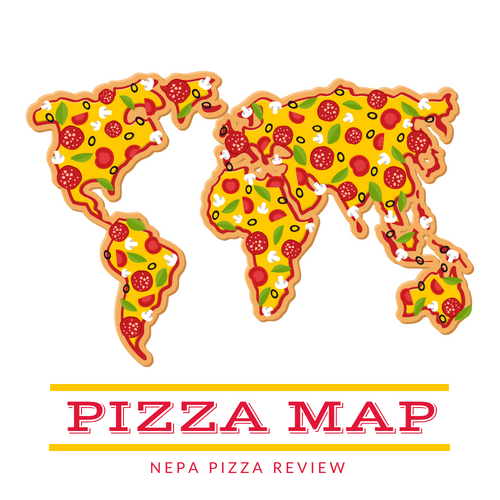 I received an email from the owner who wanted to put his pizza to the NEPA Pizza Review test, so of course I took him up on it! (For the other business owners who have also emailed me requesting a review, I am working on it, but I won’t tell you when I’m coming!) Keeping true to my roots, I accepted the challenge and visited the location which is pretty easy to get to (about 1/10th mile off of Market Street). I called ahead for my order, and since I wasn’t familiar with the pizzeria I asked the gentleman on the phone what they sell the most of, and instead of giving me a quick response like some restaurants do, he took the time to explain the entire pizza menu and what some of the more popular items were. This was much appreciated, and you always get brownie points in my book for providing great service, and this was an excellent example of just that. 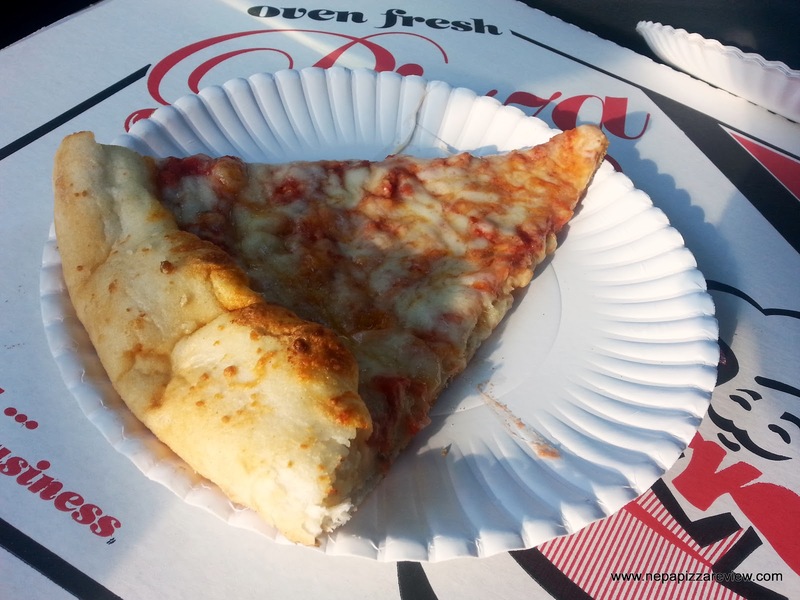 After hearing about all of the tasty gourmet offerings, it felt like a bit of a let-down to order my traditional plain cheese pizza for review. Nevertheless, I placed the order, gave my name, and the pizza maker said “give me fourteen and a half minutes.” I laughed, but if he was issuing a time challenge, I was putting him up to this test as well so I set the timer on my cell phone and took to the pizza mobile quickly. I was 15 minutes away according to my GPS, so I had to make up a little time – of course stopping at every stop sign and abiding by every posted speed limit! I kept my eye on the clock as I raced to get through Scranton, and unfortunately this was one time that my GPS was right on the money, I got there in 15 minutes and a few seconds to spare. I jumped out of the pizza mobile and rushed in, only to see that my pizza was steaming hot on top of the oven. The pizza guy had won the “fourteen and a half minute challenge” and I respect that. From our discussion on the phone, I knew I ordered an 18” pizza, which is huge, and here in NEPA, the going rate is around $14.00 or more for a plain cheese, so when the pizza guy told me it was $9.95 I was totally shocked. That has to be the cheapest 18” pizza I’ve found in the area. I paid him, and ran out to the pizza mobile to get a look at this value pie. 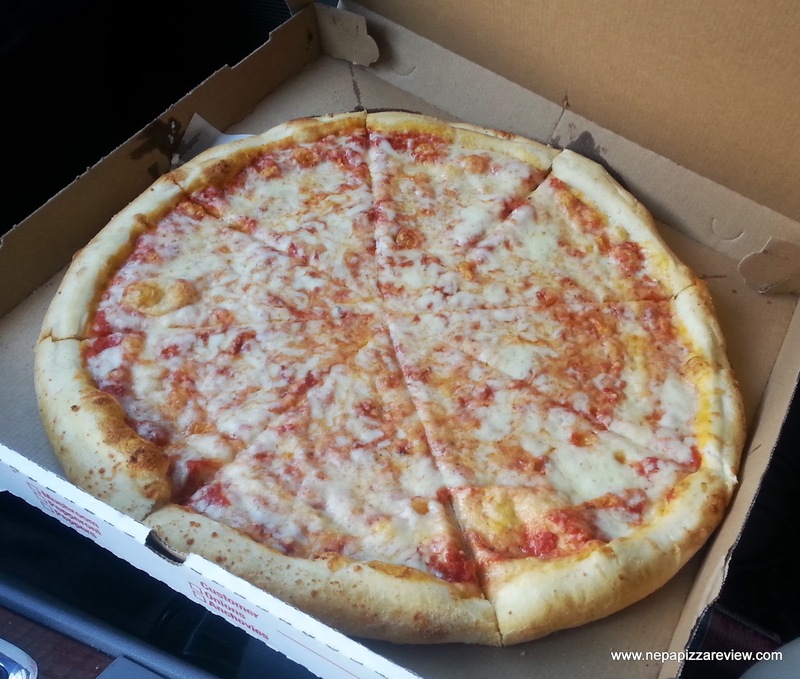 I set the pizza down, and my car was filled with a pleasant garlic smell, sort of like when you walk past the fresh baked breadstick oven at the Olive Garden. 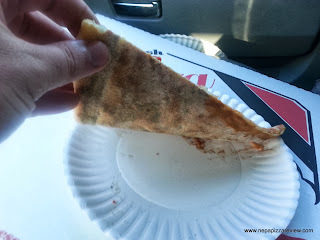 I was in a hurry, so I couldn’t try the pizza immediately, but the smell was too much and I had to reach for a slice while driving. I opened the box to find a giant pizza with a very thick, fluffy crust, covered with plenty of sauce and cheese. I was very curious about this pizza, because traditionally I like a thin crispy crust, and it was clear that this was not the type of pizza I had ordered, but we don’t judge before we try! I took my first bite and noticed how soft and tender the crust was. It was not crispy at all, which usually means chewy and doughy, but this was NOT the case here. The dough really had the consistency of a breadstick, and it was 100% cooked through. This crust is certainly one of the more unique ones in the area because of its thickness, fluffiness, and tenderness – and I really enjoyed it. The sauce was pretty hearty, which is something I always like. There were a few small tomato chunks which I like, but they weren’t big enough to drive away you smooth sauce lovers. The cheese seemed to be good quality mozzarella, but the sauce and cheese aren’t really the main focal point of this pizza – the dough is. In addition everything else I’ve said about the crust, it seems that the garlic aroma might be coming from a light dusting of granulated garlic around the crust. I’m not sure if this was sprinkled on after it was made, or if this was blended into the flour while the dough was being stretched. Either way, this was a nice touch that I have not seen in my near 100 pizza visits so far. Overall this was a good pizza which is pretty unique. I would bet that it has mass appeal and would be great for parties. Add in the extreme value at $10 for an 18” pizza and you have the ultimate party starter. I took a look at the restaurant’s website and it looks like there is a vast menu of Italian specialties which goes way beyond pizza. The prices all look very fair, and if the portions are anything like the pizza, I’d say you would probably leave with a full stomach as well as a not so empty wallet. Because of the high quality customer service, great value, tasty pizza, extensive menu, and convenient location, I give this the NEPA Pizza Review stamp of approval. $10 for an 18" pie? Wow! I too recently had a pizza that used garlic powder in the crust. I don't think it would work for every pizza, but it took the one I had up a level. A Little Pizza Heaven's outer crust looks perfect for dipping into something!